The creatures in your mouth: Microbiome explained. You need to feed the bacteria in your mouth. Your mouth is one of the most bacteria-ridden parts of your body, teeming with trillions of little organisms of over 600 different species who just, like, chill. But, don’t panic and rinse your mouth with hand sanitizer (really. don’t!). This bacteria makes up an ultra-diverse community that can be good (think bacteria block party BBQs) or bad (think bacteria neighbor who blasts Christmas music at 1AM in September) — and you’re in control of it like it’s a game of The Sims. Meet your oral microbiome, and learn how to nurture it. What even is an oral microbiome? Think of your mouth as a planet called Mouth Mars after SpaceX successfully creates a colony. But, instead of human inhabitants, Mouth Mars is colonized by single-celled organisms called bacteria. You’ve probably heard of bacteria — they’re really small and don’t have organs. They’re literally just a cell. Science! This bacteria creates giant communities in your mouth with many different factors influencing them, and different species within the communities interacting with each other. This overall community is your oral microbiome: A mini world of its own made up of bacteria from all walks of bacterial life. There are distinct “cities” within your mouth planet, including one called biofilm. You know how the side of ocean rocks or basically anything that’s wet is covered in a layer of ew slime? That’s biofilm — and the plaque that covers your teeth is a version of it. This biofilm is made up of bacteria and microbes just like any of the other cities on Mouth Mars (keeping with the cheesy analogy), which might live in pockets within your gums. 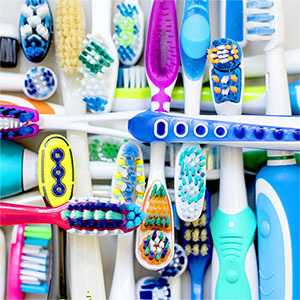 While biofilm can be harmful to your teeth and gums, some of the life within it collaborates with other species to maintain stability on Mouth Mars. S. Mutans, for example, is one of the bad-bacteria-guys that lives in your mouth. When the climate in your mouth becomes more acidic, they replicate really fast and burrow into your teeth in the beginning stages of tooth decay. Lactobacilli are the nicer friend of S. Mutans who falls to peer pressure. Lactobacilli normally are just kind of... there. When your diet contains more simple carbs, though, they replicate and get in on the tooth decay fun before moving down your digestive tract and potentially impacting other parts of your body. Where does your oral microbiome come from? How do you maintain a healthy oral microbiome? Researchers are *finally* starting to understand how the bacterial community in our mouths work, let alone figuring out how to keep them healthy. But, there are some simple things you can do to maintain a healthy oral microbiome: Eat right and keep a healthy routine. Being mindful of the simple sugars and carbs we’re eating in desserts, baked goods, and cereals is a good start. When we put these into our mouths, it’s like polluting our mouth atmosphere. It can change the climate of our mouths that has drastic impacts on our oral microbiome, our gut microbiome, and our overall health. That’s why keeping a proper oral hygiene is ~sooo~ important. If you’re cleaning away your biofilm before there’s a chance for bad bacteria to replicate, you’re creating a clean slate for the community to maintain itself without the interference of crumbs from that cookie you ate this morning. Too much clean is a bad thing, though. 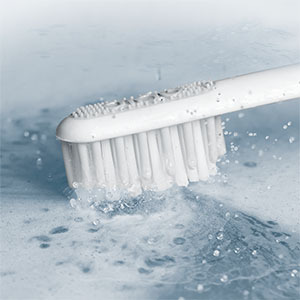 Antibacterial mouthwashes, for example, kill both good and bad bacteria. If you’re creating imbalance in your microbiome by killing different species, you’re potentially creating an even more harmful environment for the future. 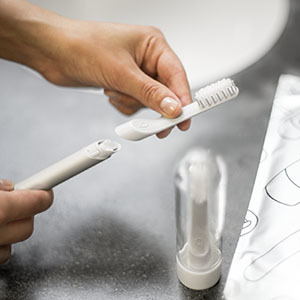 Brushing your teeth twice daily (for two minutes!) and maintaining a toothbrush that removes plaque properly (and flossing!) will have one of the biggest impacts on restoring peace among Mouth Mars citizens.